In addition to being a professional artist, I’m also a full-time, middle school teacher. Consequently, I’m pretty comfortable in front of a crowd. I have experience speaking on topics relating to art production, art education, art marketing, public art and the creative process. 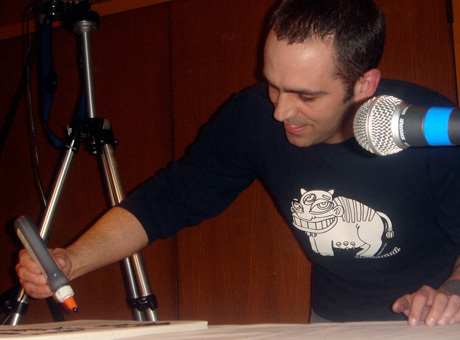 Presentations typically feature live art, audience participation and original art giveaways. I’ve delivered such presentations at local schools, colleges, community centers, art galleries and libraries as well as on television. On the other hand, I can shut my trap and just focus on paint slinging if you’d prefer. In fact, I’m an active member of a number of local musical groups. During the bands’ performances, I perch myself on stage and whip up a bushel of paintings. Drop me a line if you’d like to see me talk the talk and/or walk the walk at a venue near you.